Who doesn’t love a backyard party in the summer time? Whether it is a graduation party, bridal shower, or another type of bash, catching up with friends and family and snacking on the summer’s best food can be so refreshing. If you’re the host of this year’s gathering, we’ve got a few resources and ideas to help get your planning started. Choose a theme: Picking a theme can be a fun way to spice up your party. Choose something and follow it throughout all your party elements like decorations, table settings, napkins, center pieces, etc. This is especially fun for a baby shower, engagement party, or bridal shower. Food: It is okay to choose hot dogs or hamburgers for a main course. They’re easy and generally a crowd favorite. Incorporate the foods of the season. Watermelon, berries, corn, and tomatoes are great to use in the summer time. For sweets, try a “make your own sundae” bar. Get a variety of toppings like sprinkles, syrup, chocolate chips, candies, or gummy worms are sure to please guests of all ages. Oprah.com and Epicurious.com have a few fun recipes to try if you want to go beyond burgers and chips. Outdoor Games: Come up with a couple fun games people can participate in. Perhaps set up a badminton court or a bean bag toss. Check out five fun outdoor party games here. Having a more low-key affair? Bring easy board games like Boggle or Apples to Apples outdoors for a few laughs. Music: Having a summer party playlist will keep your party upbeat and set the mood you want. 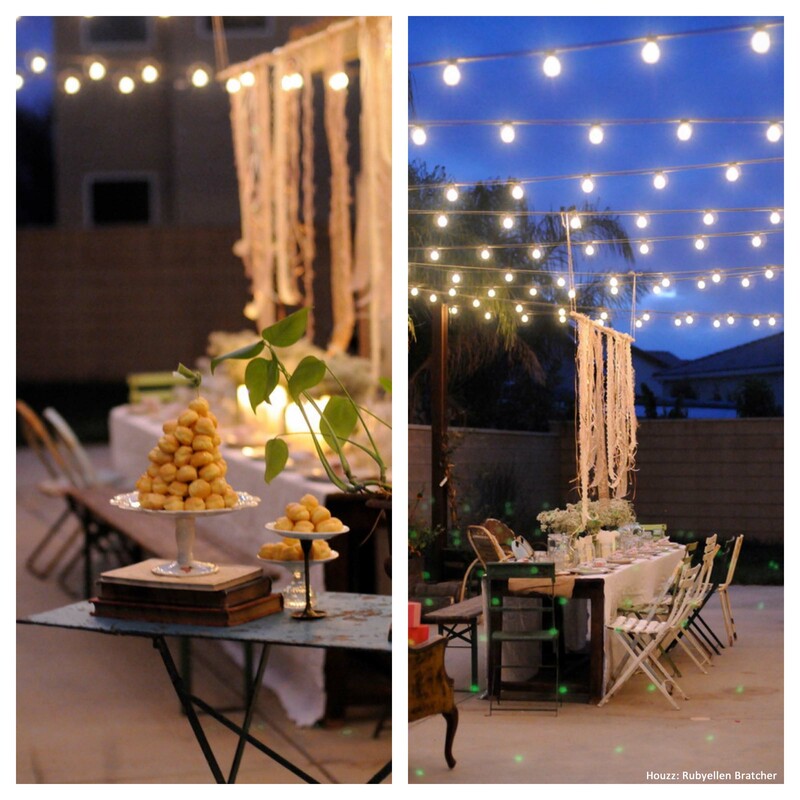 Decorations: To set your gathering apart from the rest, try adding easy outdoor decorations. For example, paper lanterns in the trees or pretty vases on the table. Better Homes & Gardens, Country Living, and Home Made Simple have a few creative ideas. Stay Green: If using real plates and forks for your backyard bash isn’t an option, choose melamine over plastic. Melamine is more durable and can be used again. Plastic forks and paper plates and get expensive to buy over and over. Also, don’t forget your cloth napkins. These will save you money on paper towels and help reduce waste. Remember, no matter what food, games, music, and decorations you choose, plan early! The more that is taken care of before your guests arrive means the less you have to worry about during the event. The host deserves to have fun too! Be sure to check out our other blog Tips for Building Outdoor Kitchens which can also come in handy when hosting a great outdoor party!